From Brent Dickerson: “Bourbon Roses are named for the Ile Bourbon, now called Reunion, in the Indian Ocean, where they traditionally are supposed to have originated from a natural cross between the China `Parsons’ Pink’ and the red `Tous-les-Mois’, a Damask Perpetual, two roses which were used as hedge material on the island. (This, however, is an area of hot dispute in almost every particular.) 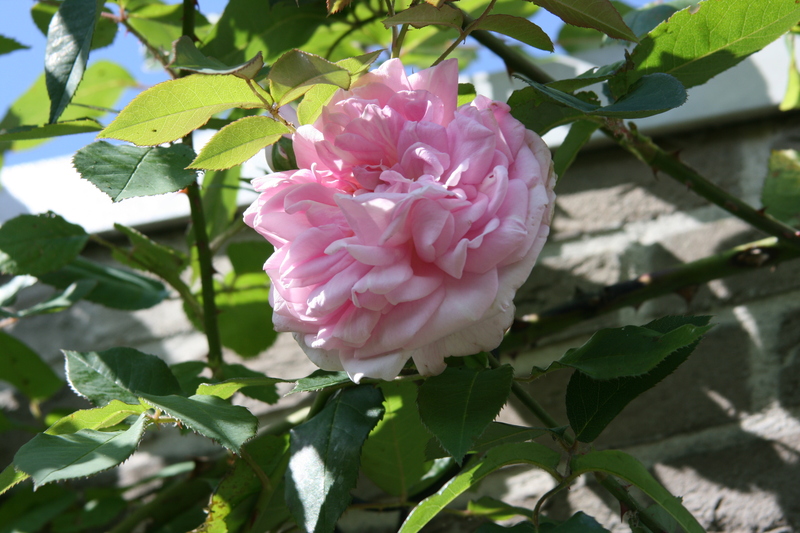 The way in which the virtues of its disparate parents were combined made these new roses popular, and after ten years of largely unsuccessful attempts, good new Bourbons began to come out of the breeding grounds in the 1830’s. In the best of them, vigor was combined with floriferousness, and beauty with fragrance. A typical Bourbon will have the arching growth harkening back to its Damask ancestors, with the lush flowers and fragrance from much the same source; but it will also have a strong tendency to rebloom from the China ancestor, as well as a certain often subtle influence of the China flower form. Bourbons, however, are often not typical at all, and range from the arching growth just mentioned to the very dwarf, China-like growth of the cultivar ‘Hermosa’, indeed one of the oldest Bourbons still available (it had shown up by 1835). They range in color from deep reds through pinks to blush and white. From the website of Paul Barden: Click here to read a more detailed article by Brent Dickerson on the evolution of the Bourbon roses. I am curious to find out what blog platform you are utilizing? I’m experiencing some minor security issues with my latest website and I’d like to find something more safeguarded. Do you have any suggestions? Very interesting advice!Suitable precisely what I had become seeking out! Keep up the superb piece of work, I read few blog posts on this site and I conceive that your blog is rattling interesting and has circles of excellent information.